Natural teeth are as precious as diamonds and are worth protecting. When a tooth is lost, there are a number of undesirable changes that arise in the oral cavity. First the chewing efficiency of the patient diminishes. As a result of this, there may be more stress on the remaining teeth and the muscles that aid in chewing hard food items. Tooth loss affects the jawbone and the alignment of your teeth. Our implant dentist recommends tooth restoration to address the problems mentioned above and many more. If you or your family members are suffering from tooth loss, come speak to our dentist. Dental implant surgery performed at our SmileLine Dental office in Ramsey, New Jersey can recreate a healthy smile for you and help you improve your oral health. A tooth may be lost because of decay, gum infection or from trauma. The loss creates a gap in the dentition. This gap can attract food particles. Food lodgment in the gap can increase the chances of gum infection. The opposite tooth does not have a contact surface on the other side which can lead to tooth wear. The gap created by tooth loss can cause the nearby teeth to shift positions leading to misalignment. There is jawbone resorption and drop in chewing efficiency. When many teeth are missing, the patient may lose confidence to eat hard food items. Dental implants are artificial replacements to lost tooth roots. They are made of titanium or zirconium and are designed to integrate with the supporting jawbone. Once the implant is surgically inserted into the supporting bone structure, it can undergo Osseointegration to become a functional part of the bone. This may take few months. 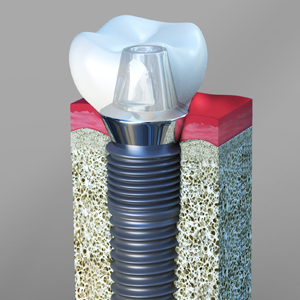 An artificial crown is bonded or screwed over the implant that acts as a replacement tooth. Dental implants can last a lifetime if proper care is taken. The restoration protects the supporting bone and prevents it from resorption. For successful restoration of the tooth using the dental implant, the patient must have a healthy bone. Our dentist performs an examination of the jawbone and the patient’s oral health. If the patient's gums are infected, the condition may have to be treated first since surgery can expose the bone to bacteria. X-rays may be taken to check the status of the supporting bone. Patients, who have medical conditions like uncontrolled diabetes and patients who have undergone radiation therapy for cancer in the head or neck region, may have to inform the dentist about such conditions. Once our implant dentist confirms that a surgery can be performed, the restoration plan is explained to our patients. It may take about 6 months to complete the dental implant restoration. Dental implant surgery is performed with the help of local anesthesia. An oral sedative may also be recommended by our dentist for the surgery. First, an incision is made in the soft gum tissues to expose the bone. A series of drills are used to create a bony recess. The implant is torqued in the supporting bone and the gums are sutured back. The implant is covered with a cap and left to heal for few months. After the healing period, our dentist checks the integration of the implant. On confirmation that the implant is successfully integrated with the bone, we will take impressions of the teeth and get a dental crown fabricated in the lab. The implant cap is removed and an abutment is fixed over the implant. The permanent crown is either bonded or screwed over the implant to complete the teeth restoration procedure.